I remember in junior high, a book that I checked out of the school library more than any other was an old anthology of Russian fairy tales. I was well into reading SFF by that age, so I assume that the fantasy reader in me was attracted to the promise of whatever treasures that book contained. I must have renewed it something like four or five times. There was an exoticism to these fables that hooked me, and I can’t remember ever having a similar interest in, say, the Brothers Grimm or Hans Christian Andersen. 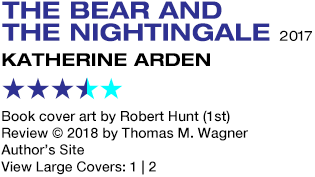 So if anything impressed me about The Bear and the Nightingale, the debut novel from Katherine Arden, it’s the way her meticulous prose manages to replicate the haunting atmosphere of these folktales, sweeping me away to another time and place where lonely farmhouses are warmed by hearth fires while the icy cloak of winter enshrouds the world outside. Arden’s writing never feels like stylistic affectation the way so many fantasy authors do when they’re reaching for something mythic. It’s as if the voices of the past just naturally speak through her. Set in 14th century Russia (or Rus’, as it was then called), The Bear and the Nightingale is the result of meticulous research into the history and lore of a not-well-documented age. But it’s not a retelling of any one particular legend. It draws folkloric inspiration — much of it from the tale of Vasilisa the Beautiful — but tells an original story of a young girl caught between childhood and adulthood, and a growing tension between old ways and new. Arden’s Vasya is the youngest daughter of Pyotr Vladimirovich, the boyar — kind of a governor — of Lesnaya Zemlya, a thickly forested area of the countryside not far from Moscow, which, back then, was the capital of the Grand Duchy of Muscovy. After his wife Marina dies giving birth to Vasya, Pyotr travels with his sons to Moscow, where the Grand Prince, Ivan Ivanovich, is also Marina’s half-brother. Pyotr is seeking a new wife to run his household. Ivan seizes the opportunity to rid himself of a family embarrassment by betrothing Pyotr to Anna, the daughter of his first marriage. Everyone thinks Anna is mad, but her problem is only that she sees all the invisible creatures and household spirits that have been among people for ages. Tormented by her belief she is seeing devils and demons, Anna wants nothing more than to disappear into a convent. Marriage is not a fate she’s happy with. As it happens, young Vasya also sees these beings — the domovoi who guards the household, the vazila who protects the stables, the rusalka — because she has inherited some of her grandmother’s latent magical talents. Vasya speaks to them, sets out offerings for them, learns from them. The vazila teaches her to speak with horses. All this gives Arden the chance to establish conflict through a spin on the wicked stepmother trope. But she then raises the stakes by having Vasya’s talents come to the attention of two additional antagonists. One is an arrogant but charismatic priest, Konstantin, who has, much to his great chagrin, been assigned to Vasya’s village by the chief authority of the Orthodox church in Moscow, who isn’t happy with Konstantin’s growing popularity among the common people. The other is a supernatural entity, the one-eyed Medved, also known as the Bear, whose sinister presence is growing in power, and only held in check by his brother Morozko, who happens to be Death. With a command of her craft and a sense of storytelling confidence that you don’t often see in veteran novelists, let alone debuts, Katherine Arden builds slow-burn suspense as Konstantin draws the villagers under his sway and undermines their beliefs in the old ways, despite their having coexisted comfortably with Christian faith for ages. There’s something frighteningly relevant about the depiction of a demagogue who can sway an entire population into going against their own best interests. Konstantin himself is a fanatic’s fanatic, obsessed with painting icons, and unaware that his dogmatic single-mindedness makes him vulnerable to powers he can’t begin to comprehend. As the protective influence of nature’s spirits fade, the Bear’s terrible power grows. Arden’s portrayal of Vasya and her family gives the story a strong character foundation. Vasya’s relationship to her siblings and father feels warm and real, underscoring Vasya’s determination to decide her own fate in a society that offered women essentially two choices in life, marriage or the convent. Even Anna avoids becoming a shallow villainess because there’s a real pathos beneath the tragedy of her life. Still, Konstantin has precious little depth. Elsewhere, you can see Arden making some first-timer flubs. She struggles at the book’s beginning with some narrative choices. For instance, early chapters make a major character out of Sasha, Vasya’s oldest brother, who travels with Pyotr to Moscow and decides then and there to become a monk. Arden devotes enough time to all this that we expect Sasha’s storyline to be significant. But after Pyotr marries Anna and returns home, Sasha disappears from the book altogether. Also, the final chapters do end up sacrificing some of the dreamlike, mythical qualities that Arden so effectively created at the outset, in favor of a boss-battle climax that feels rushed, not to mention all too conventionally Epic Fantasy, complete with the expected sequel-setup denouement. But mostly, The Bear and the Nightingale is a lush, dark, enchanting adult fairy tale that comes to us like a spellbinding dream from a far distant time. Followed by The Girl in the Tower.